Dogs fitted with longer casts for hind-leg injuries or ailments should see fewer pressure sores and soft tissue complications than dogs with shorter casts, said Morris Animal Foundation-funded researchers at Colorado State University's Veterinary Teaching Hospital. The research team placed pressure sensors on dogs' legs to test the level of force they feel while wearing casts of two different lengths. The team published their findings in The American Journal of Veterinary Research. "This is an important finding that can be put into place today to help countless dogs in clinics all around the world," said Dr. Kelly Diehl, Senior Scientific Programs and Communications Adviser at Morris Animal Foundation. "Having a dog in a cast is challenging for both the dog and its owner. You want to make sure the dog has the best opportunity for healing, with as few complications as possible. This study gives veterinarians new information to make better decisions that will improve animal care. It's exactly the kind of research we're proud to support." 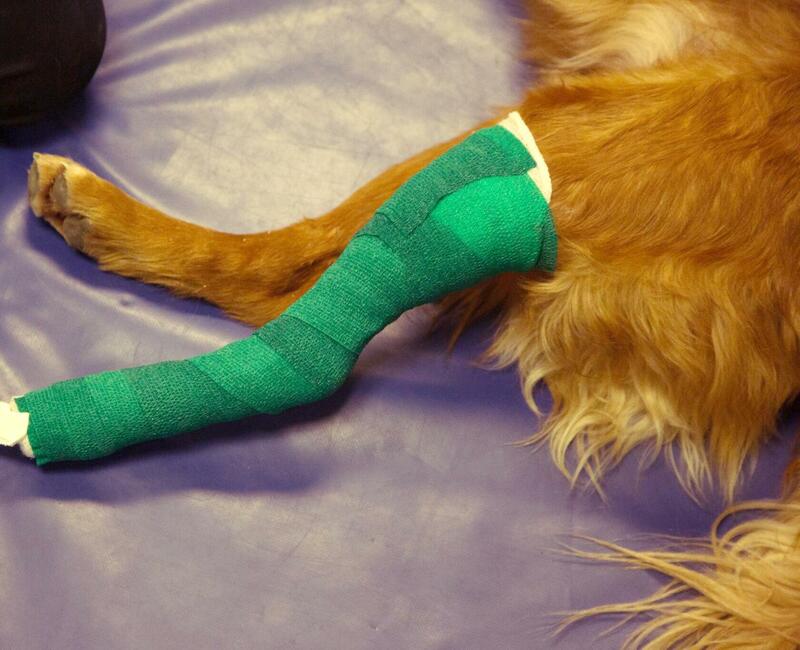 Casts and splints often are used to stabilize dogs' hind legs following fracture injuries and surgeries. However, many times, the casts themselves cause soft tissue complications such as pressure sores, edema and dermatitis. Not only can this result in prolonged pain for dogs and extended veterinary care, but in rare cases, limbs must be amputated. Traditionally, veterinarians fit dogs with hind leg conditions with casts that immobilize from the joints above and below the condition. If, for instance, a dog's lower leg is fractured, a veterinarian would usually make a cast that stretched from the toes to just above the hock (joint between the paw and knee, which points backward). Until now, there has been little research to determine if there was a better method that might decrease secondary injuries. For their tests, the CSU researchers first placed pressure sensors over the calcaneus (heel bone) and cranial tibial surface (shin bone) of 13 dogs. The dogs then were fitted with a fiberglass cast that ran from their toes to their stifle joint (knee). They walked on a gait analysis mat so researchers could make sure the dogs were placing the same pressure and fully using the casted leg. The amount of force on sensors inside the cast was then measured. Afterward, the cast was shortened to stretch from the toes to just above the calcaneus. The pressure inside the cast was then measured again. Researchers found that the shorter cast created about twice the level of average pressure when compared to the taller cast. They concluded this was due to the longer cast distributing pressure evenly over nearly the full length of a leg, rather than over a shorter area on thin tissue covering bony protrusions. "What we found is clinically significant because we conducted this research over the course of a few walks, but dogs are usually going to walk around in a cast for six to eight weeks, so the level of pressure is going to multiply exponentially," said Felix Duerr, Assistant Professor of Small Animal Orthopedics and Sports Medicine, and principal investigator of the study. "For veterinarians, we would advise going as high on the tibia as you can when making casts like these for the good of the dogs in their care." Ashley Iodence, a veterinary student at CSU, conducted much of the research for this study as a Morris Animal Foundation Veterinary Student Scholars program participant. The program, funded by the Foundation, supports first- or second-year veterinary students conducting research projects during their summer break. The primary goal of the program is to assist in the development of knowledge and skills of professional veterinary students in comparative and veterinary medicine-related research problems.